With the last 16 entering day four of the Dynamic Billard Leende Open on Saturday morning, Friday was time to say goodbye to the other 143 players on who made their way to Leende Netherlands for the fourth stop on the tour calendar. 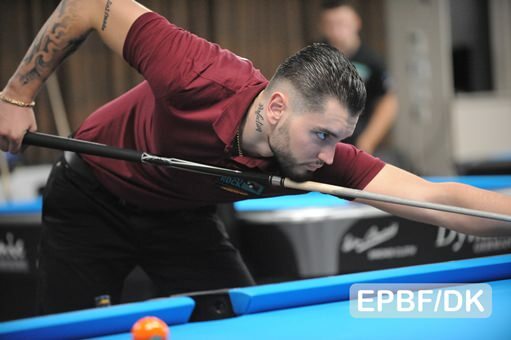 Eklent Kaci, Albania’s biggest billiard talent is the new number 1 on the European rankings, largely down to his own enormous talent, and a little helping hand from Shane VanBoening. With the single elimination starting, the draw brought the current number 1’s from their respective continents together, Europe’s Mario He and USA’s Shane VanBoening entered the centre stage. Shane started well and raced into an early 5-1 lead over Mario who was clearly struggling with the pressure and expectations of a continent. With the match slipping away, Mario took a technical time-out with his coach and suddenly, found the rhythm that was missing earlier pulling the match back level 5-5 to the delight of the Europeans in the audience, Shane was now suddenly on the ropes. A mistake by Mario in the 11th rack and a few positional errors thereafter cost him dearly and a match that was Mario’s for the taking, slowley slipped away with Shane shooting some amazing shots to close the match out 9-6 and move to the last 16 while Mario must reflect on a missed opportunity. Oliver Ortmann rolled back the years and sits pretty in the last 16 after beating a promising Saudi player in Saad-Ali Aldrees, who can surely be happy with a top 32 spot at his first Eurotour. Oliver however, has his sights on a bigger fish to fry and will take on Albania’s Eklent Kaci in the last 16 at 10am Saturday. Both these players had beaten the top Dutchman, Niels Feijen on their way to this point and will be hoping for more glory when play starts tomorrow. It was not all doom and gloom for the Austrian contingent as Maximillian Lechner and Albin Ouschan survived a slight scare in their own matches but now have a good chance to be in the mix when the medals are given on Sunday. The other Americans who are mingling with the best Europe has to offer are Skyler Woodward, Corey Deuel and Billy Thorpe, the later having the misfortune of playing Shane in the last 16 Saturday. If there is a consolation of a meeting like this, it has to be that one of the USA team will make it to the last 8 players. Friday through Sunday, EPBF will show two feature matches LIVE on the EPBF Facebook page. The complete tournament is shown on kozoom.com for premium pass holders. The Dynamic Billard Leende Open 2018 will continue tomorrow morning at 10:00 local time with matches from last 16 players single elimination. The event is hosted by the European Governing Body for Pool, the European Pocket Billiard Federation (EPBF) and organised by International Billiard Promotion (IBP). For further information and reference please go to www.eurotouronline.com . You can also visit us on our Facebook page or check out the EPBF YouTube channel for regular news clips or contact our press office press@epbf.com. The Big One is Finally Here!